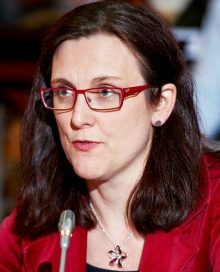 Cecilia Malmström is the European Commissioner for Trade, a portfolio that will be of particular importance in terms of negotiating the UK’s future trade deal with the EU. Malmström is a Swedish national and a Brussels veteran, who, representing her liberal party, started in Brussels as a Member of European Parliament in 1999. In 2006 she returned to national politics, where she became Minister of European Affairs for Sweden’s liberal centre-right government. Following the European elections in 2009, then European Commission President José Manuel Barroso offered her the role of Commissioner for Home Affairs, a demanding portfolio covering asylum and security. She was appointed Commissioner for Trade in 2014. Malmström spent part of her childhood in France and completed a PhD in Catalan and Italian regional politics. Considered by others as a true European, she is a respected negotiator that has had experience in dealing with negotiating trade agreements with several countries, including Canada, Japan and the United States. She has a team of around 700 civil servants, who have negotiated free trade deals on the EU’s behalf for decades.